Hello everyone and happy Friday! Gosh, now that school is back in full swing this week seems like it just flew by. 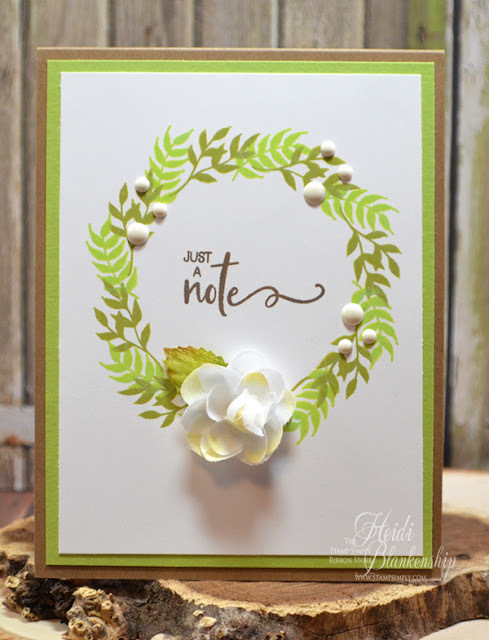 Today, I have a CAS (Clean And Simple) card to share with you that I think might be a record for how quickly it came together. But it has a very fresh and clean look to it and I love it! Here is a look at the card I designed. 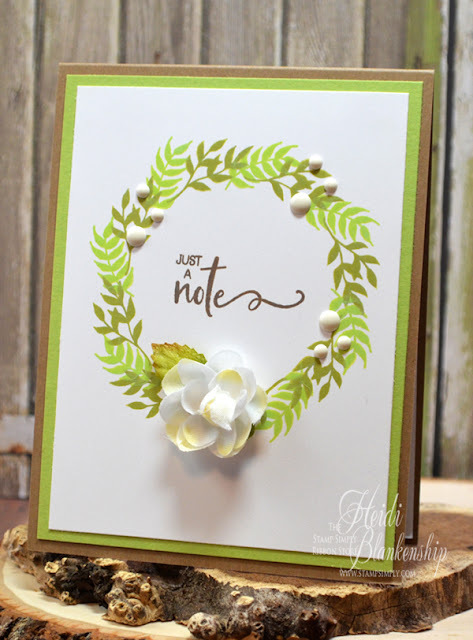 I love the leaf images from the Stamp Simply Clear Stamps - Farmhouse Signage SS-027 stamp set. 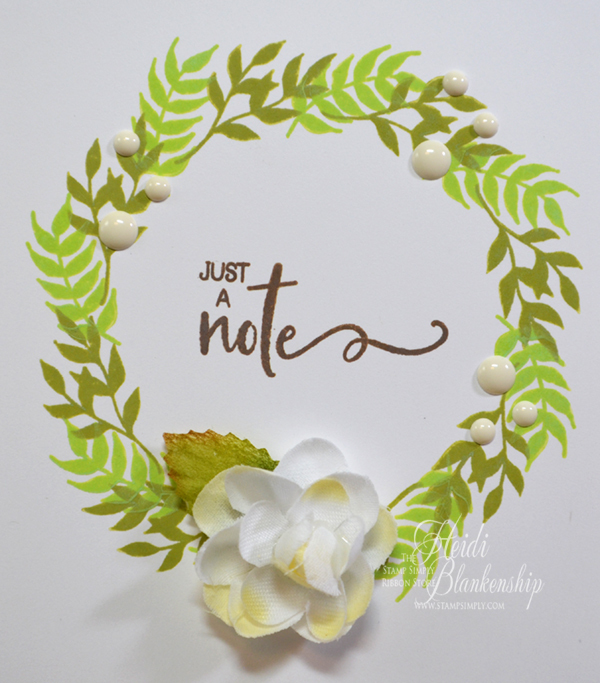 I used two colors of the Tim Holtz Distress Oxide Inks - Peeled Paint and Twisted Citron to stamp the leaves into a wreath shape. Then I stamped the sentiment in the center with Tim Holtz Distress Oxide Ink - Walnut Stain ink. To finish off the card I added a few My Mind's Eye Record It Charmed Enamel Dots and a Petaloo Botanica Collection Baby Blooms White flower. The card came together so quickly I forgot to take a picture when I was making it. 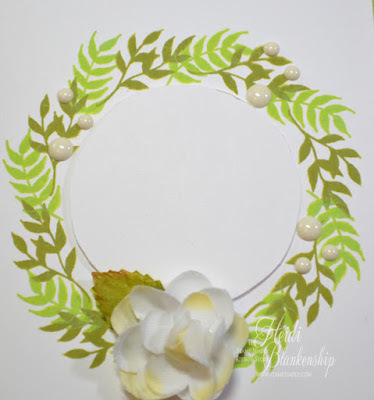 But to speed up the time for creating the wreath and help give me a guide for a nice circle shape I cut out a circle from scrap paper and then stamped the leaves around the outer edge. Like I said, record time! This would be a great card to create multiples of. 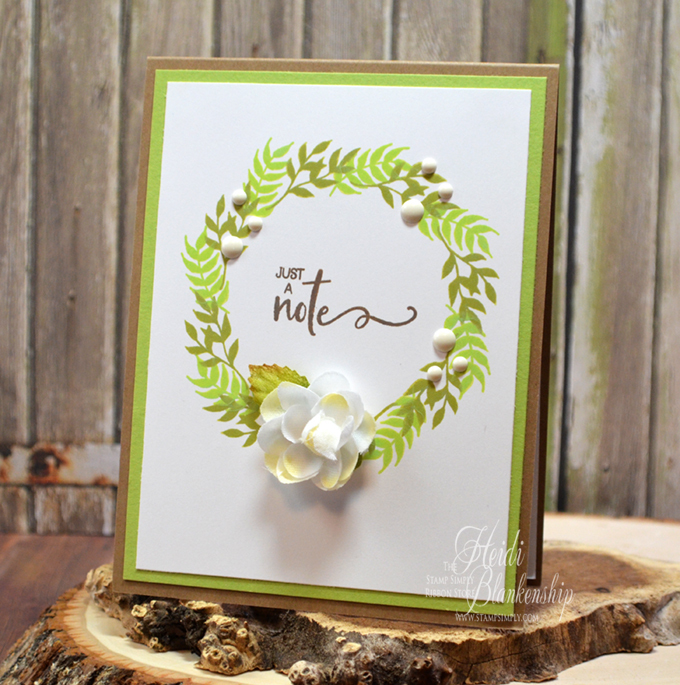 The card base is a A2 kraft top folding card with a layer of green added to bring out the green in the wreath. I hope you enjoyed today's CAS card share. All of the supplies used are listed and linked below and can also be found at The Stamp Simply Ribbon Store. If you would like to see more care inspiration I encourage you to check out the Stamp Simply Blog. Thanks for providing the details for this wonderful CAS card. It is perfect for so many occasions and by changing the colors a bit would work for any season or holiday.